Info "Shake the thermometer and bring the reading down to zero. Check it occasionally to see where it is." Mercury Falling is one of Penny's Microgames in WarioWare: Smooth Moves. The name of this microgame is a pun on the 1996 album, Mercury Falling. 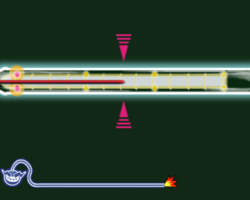 The player has to first shake the thermometer to clear it. Then, they must stop to read the thermometer. 1st level difficulty: The temperature starts low. 2nd level difficulty: The temperature starts higher. 3rd level difficulty: The temperature starts high. This page was last edited on February 20, 2018, at 16:16.